As above tent, we make in commercial grade clear PVC and PVC tarpauin, which is flame retardant and high durable. 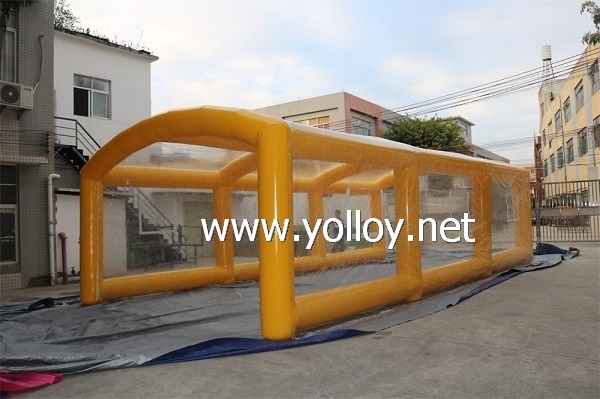 Also,we use professional heat sealing machine to build two pieces material together and make it into one piece.And it only needs the air pump to inflatable it ,once inflating,it can keep the inflatable shape few days,not need the air pump to inflate it all the time.So if you need the unit mostly permanent and transported to a location occasionally.The inflatable tent will be your best chioce. Isn't it? Customized can be acceptable.If any requirement about size,color and logo,pls advise us. Or if you have a sketch and some special idea, you also can share with us,we would like to work with you for perfect car tent you want.